THE AEGEAN SEA is an arm of the MEDITERRANEAN SEA, located between the Greek peninsula to the west and TURKEY to the east. The Aegean is connected through the Dardanelles, the Sea of Marmara, and the Bosporus with the BLACK SEA, while the island of Crete is considered to be the southern boundary. In all, it is about 380 mi (611 km) long and 186 mi (299 km) wide. It has a total area of approximately 83,000 square mi (214,000 square km). stemmed from Aegeus, the father of Theseus, who drowned himself in the sea when he mistakenly thought his son had died in a distant war. The formation of the sea occurred when the Tethys Sea or Seaway began to shrink over the last 120 million years as the approaching African and European plates closed off the Mediterranean and surrounding seas. During the last Ice Age (2,000,000 to 18,000 B.C.E. ), the shallow and narrow Straits of Gibraltar blocked off much of the ATLANTIC OCEAN waters, which led to a saline crisis as a high rate of evaporation in the nearly arid region created a shallow, briny basin. Even today, the generally shallow (average depth of 4,921 ft or 1,500 m) Mediterranean Sea has a low exchange rate with the Atlantic and is saltier. The maximum depth of the Aegean is found east of Crete, where it reaches 3,543 m (11,627 ft). The rocks that make up the floor of the sea are mainly limestone, though proximity to a plate boundary has allowed volcanic activity to alter it. The Aegean is studded with numerous large and small islands that are the mountain peaks of Aegeis, the name given to a submerged land mass. 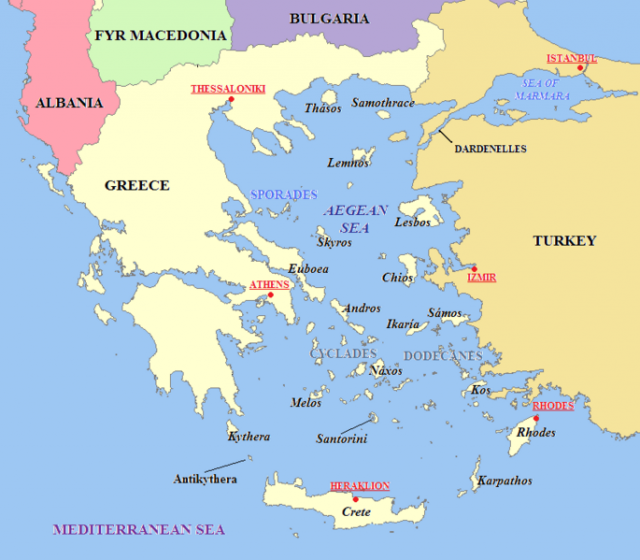 The Aegean islands can be divided into seven groups: the Thracian Sea group, the East Aegean group, the Northern Sporades, the Cyclades, the Saronic Islands, the Dodecanese, and Crete. North winds prevail over the Aegean Sea, although periodically, the cold gale-force Bora katabatic drainage wind thunders into the sea from the Balkans. The low tides generally follow those of the eastern Mediterranean. However, the tide of Euripus, the strait between Greece and the island of Euboea, demonstrates a violent and uncertain character, leading to the term the Euripus Phenomenon. Cold water masses with fluctuating temperatures flow out of the higher BLACK SEA, impacting the deep waters of the Aegean. The low concentration of phosphates and nitrates, necessary for marine life, limits fishing to sardines and sponges. Likewise, the barren, rocky soil hinders agriculture. Thus, tourism remains the major source of income for the Aegean coastal countries.